The group was off to a strong start with 5x programmatic revenue year over year. To further grow their profit margin, in Q1 of 2018, they challenged Smart to diversify their inventory while keeping control over demand sources. Their goal: increase programmatic revenue without sacrificing user experience of their valued audience. Smart provides a non-intrusive, customizable and responsive native ads solution that offers elevated lift for brand affinity and purchase intent responses. As native ads slip seamlessly into content, users are more receptive to them. CPMs are higher than for both standard banner and Rich Media ads. 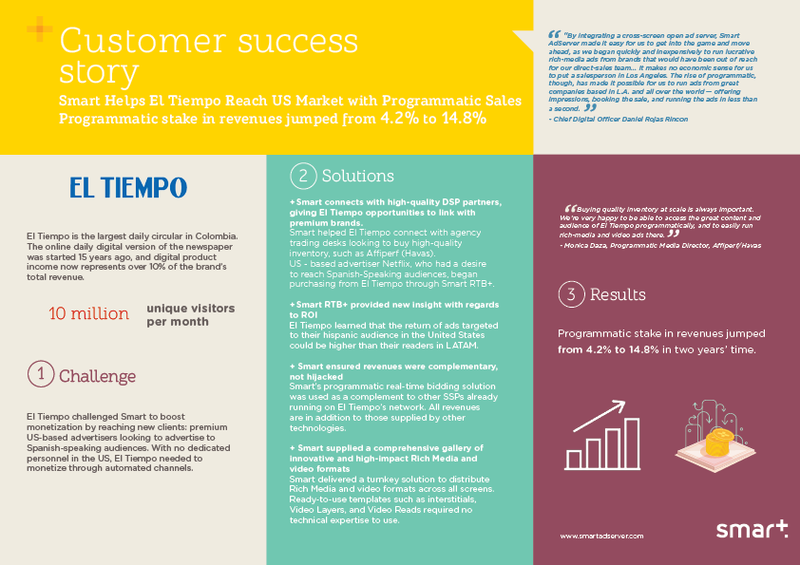 Smart makes native ads inventory implementation easy for Spanish Media Group. By setting up inventory on existing banner placements with a native ads template, the need for an additional technical setup is completely eliminated. The customer simply uses Smart’s Native Ad Studio to generate the necessary code. Smart’s full stack solution provides the media group with an integrated platform on which to run their entire ad serving business — including direct and programmatic, across all digital formats and screens. It allows publishers to deliver advertisements on the right device, in the right format, at the right time. Spanish Media Group is running Smart RTB+ on both desktop and mobile web. To maximize revenue, they are selling inventory using a variety of programmatic buying methods, including Open Auction, deals, and Deal +, Smart’s curated deals solution. Smart’s full stack has a complete view of all inventory as well as each buyer-seller commitment, which allows for holistic campaign management. New native ads demand sources are placed in holistic competition against standard banners, parallax, and Video-Read formats. Native ads are placed at same level in the waterfall as the other formats, but at a different floor price. Programmatic stake in revenues jumped from 4.2% to 14.8% in two years’ time.